Just Released: Another Tremendous Value Cabernet! Santa Barbara County Cabernet that rivals Napa Valley? It can only be from Happy Canyon. Set deep in the Santa Ynez Valley, just far enough from the ocean to grow terrific bordelaise varieties such as Cabernet and Merlot (not to mention killer Sauv Blanc), McGinley Vineyard in Happy Canyon is THE spot. Perched high atop a knoll in the middle of the Canyon (see pic above), McGinley’s vines have only a few feet of low nutrient topsoil before running into clay hardpan that forces the roots to grow laterally. This low-nutrient environment stresses the vines, leading to smaller clusters and more intense flavors and aromas. 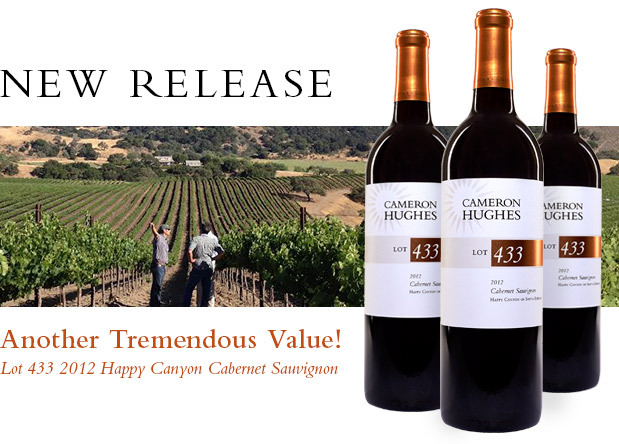 Once you pop the cork on Lot 433 2012 Happy Canyon Cabernet, you’ll know what I mean. Now here’s the real upside to Happy Canyon: you can get Napa quality fruit for considerably less than Napa prices. Custom crushed at a local winery, this Cabernet is aged for 20 months in 40% new French oak. Other Cabernets from the AVA retail for anywhere from $50-$95/bottle, so $19/bottle is an incredible price. 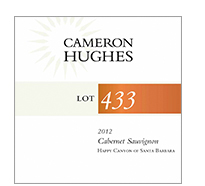 Right out of the bottle, Lot 433 delivers enticing aromas of exotic spice and brooding back plum. There are profound layers of black licorice and cola with high tone florals, making for one of the more complex aromatic structures of any wine we have offered. On the palate it’s at first dense and structured but soon lays out with pure fruit framing plush tannins for an expansive and savory mouth feel. Perfectly lush and hedonistic, with smoky raspberry and floral pastilles rounding out the juicy/spicy lingering finish. Fabulous. This is first-class Cabernet at an amazing price. Here’s a wine to buy by the case, ladies and gentlemen; it offers tremendous value and is drinking great right now. Perfect for holiday entertaining and gift giving – why not try something unique and exciting? As always, its quality is guaranteed! As always, if you have any questions or need assistance with your order, please don’t hesitate to email us or call 800-805-1971.
please add us to your address book or safe list. Got this as a forward? Sign up to receive our future emails! Manage your subscription preferences or unsubscribe.